On the Festival of the New Guinea Martyrs 2 September 1981. Published at Melbourne by St Peter's Bookroom, 1983. Reproduced with Permission of the Rector of Saint Peter's Church, Eastern Hill, Melbourne, Australia. On New Guinea Martyr's Day, 1981, Archbishop Sir Philip Strong, former Primate of Australia and Bishop of New Guinea from 1936 to 1962, preached at St Peter's Eastern Hill. The basis of his sermon was the story detailed in the magnificent stained-glass window in the north transept of St Peter's, a window commemorating the New Guinea Mission and the martyrs of 1942. A much younger Bishop Strong had been present thirrty-five years earlier when the window was unveiled, its dedication being the focus of the celebrations of the centenary of the parish in 1946. It seemed appropriate that the parish should mark its centenary by highlighting its links with the missionary Church in New Guinea. Similarly, it seems appropriate that the Archbishop's moving and evocative sermon on the story of the window should be printed here as a tribute to Philip Strong, Bishop and Confessor, obiit 6 July 1983. It is presented as a memorial to the devoted life and leadership of this great Churchman. On St Laurence's Day, 10 August 1891, Albert Maclaren and Copland King landed on the beach below Dogura and set up the first Christian Church on the former battle ground of the tribes of that district. Eight years later Annie Kerr of St Peter's Eastern Hill went to join the New Guinea Mission, and the parish has been actively associated with the Church in New Guinea ever since. In January 1937, on the way to his new diocese, Bishop Philip Strong met Father Farnham Maynard at St Peter's Vicarage. On board the ship that brought him to Australia his daily mass had been served by members of the Dean family, parishioners at St Peter's. Father Maynard journeyed to Dogura two years late; in 1939, for the consecration of the Cathedral Church of Saint Peter and Saint Paul and to conduct a retreat for the diocesan clergy. Then war came, and in 1%I the Japanese invaded New Guinea. There are few incidents in our times more thrilling, or more humbling, than the decision of the bishop and his staff to remain at their posts; they had every opportunity to leave, but those to stay in order to minister to the people they had been called to serve. In 1945 St Peter's Eastern Hill decided to mark the centenary of the parish the following year by erecting a window in the north transept in honour of the New Guinea Mission and in commemoration of the priests, lay missionaries and Papuans martyred in 1942. 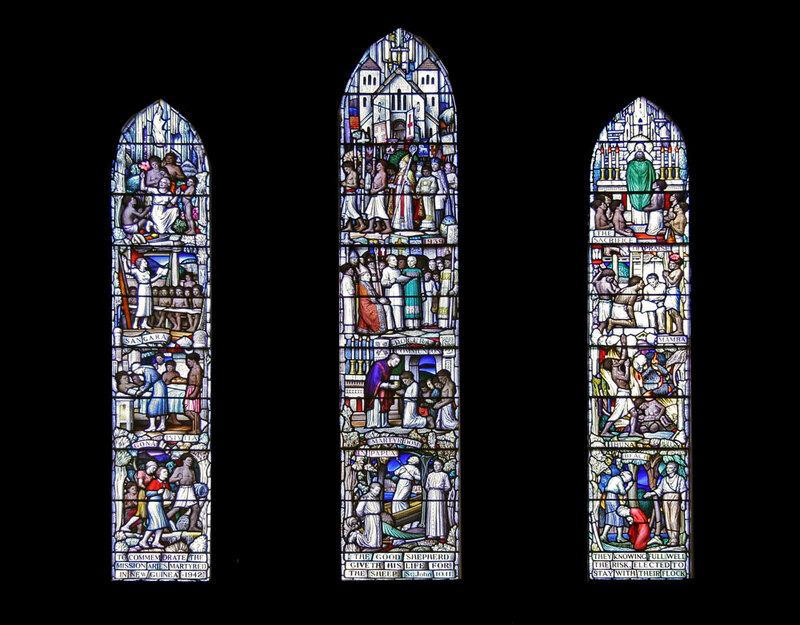 Canon Maynard commissioned Napier Wailer to execute this window, which was subsequently matched by a War Memorial window in the south transept, carried out at the same time that Wailer was working on the War Memorial in Canberra. Napier Waller [vii/viii] had established himself as one of the finest artists in stained glass in Australia, and the windows at St Peter's rank amongst his best work. Canon Maynard and Wailer worked closely together in developing the concepts that Wailer brought to life so brilliantly. The result of their collaboration is seen not only in the overall conception of each window, but also in the careful attention to detail. Nor is this surprising, for the centenary memorial window represented places and events with which the parish had dose associations, and people whom Canon Maynard knew well and loved dearly. There was Archbishop William Wand of Brisbane, later Bishop of London, to whom Canon Maynard wrote in 1946 to admit that 'I have been responsible for putting you into a stained glass window'. There was Archdeacon Romney Gill, with whom Maynard corresponded over many years about the preparation of local Papuan liturgies. There was Bishop Strong. There, too, in the window Wailer included the unmistakable figure of Canon Maynard himself, taking his place in the procession at the consecration of the Cathedral. The window was dedicated by the Archbishop of Melbourne on Sunday, 27 October 1946. Some years late; in 1963, the window was damaged by fire but, fortunately, it was able to be repaired by the artist from the original cartoons, shortly before his death. I feel it will be such a privilege to be with you at St Peter's on such an historic occasion and one so intimately concerned with New Guinea and linking us together so closely . . I appreciate very much your kindness and the honour you have done me in asking me to share in. St Peter's Centenary celebrations, and the way in which you are linking it up with the work of the Church in New Guinea and with our Martyrs. I greatly look forward to seeing the window. It will be lovely having the permanent witness. About our Martyrs. I am sorry I have not been able to satisfy your request in time for a commemoration this year, but I wanted this commemoration to come about in the right way, as a request or demand by the Church in the Diocese rather than as an action on my part. I was, therefore, waiting for the first meeting of our Sacred Synod since the War ended. This took place in our Anniversary Week in the Cathedral and, as I anticipated, a request was made to me unanimously by the Clergy in Synod to appoint a day for the annual commemoration of our martyrs and a proper for the same. This I agreed to do, and the decision that our martyrs should have a place in our Calendar was solemnly made. There was a little variation of opinion as to the most suitable date, some thinking the octave of St Laurence the most suitable, but others feeling a liter date better. I have not yet determined the date, but I lean now to a later date than August 17th and I feel with you that September 1st is a suitable time. The notional dates of martyrdom are difficult to determine in - all cases but such evidence as we have seems to indicate that all had passed through their passion before September 1st. I am hoping that it will be a commemoration that will be taken up by the wider Church, and it is good to know that you intend to do so. . . Our official commemoration of the day as an Holy Day will begin next year. The Bishop subsequently prepared the propers for the commemoration, and New Guinea Martyrs' Day has been observed at St Peter's since 1948. The commemoration on 2 September is now recognised in the new Calendar for the Anglican Church of Australia as well as in that of the American Church. The Lord is glorious in his martyrs, and in the victory of these twentieth century martyrs the wider Church has been given an example of godly courage and faithfulness. This is the text which is inscribed at the foot of your centenary window, dedicated in 1946 in memory of the New Guinea Martyrs of 1942. It is appropriate indeed that we should be offering this Holy Eucharist in thanksgiving for them, her; this evening of New Guinea Martyrs' Day. For St Peter's Church was, I think, perhaps the first church in Australia to commemorate the New Guinea Martyrs in this way and to do so in such a permanent manner that it might be a reminder of them for all time. It was the then Vicar of St Peter's, the much beloved and revered Canon Farnham Maynard, who conceived the idea of erecting in your northern transept this large window of three lights--both to commemorate the centenary of St Peter's Church and the New Guinea Martyrs. Father Maynard, as one of my Australian Commissaries, had a few years before this represented St Peter's Church, and indeed the Church in Victoria and Australia, at the Consecration of the Cathedral of St Peter and St Paul, Dogura, on 29 October 1939. This visit made a deep and indelible impression on him, and he was ever after fired by the fact that though the Church in New Guinea had been largely started and built up by the Church in Australia, yet it was now giving, by its [1/2] witness to the love and power of God, more to the Church in Australia than the Church in Australia had ever given or could ever give to it: and he was all the mote fired with this idea when, less than three years after his visit, that witness had become steeped in the blood of Martyrs. He most graciously invited me to be present when the then Arch bishop of Melbourne, the late Dr Booth, dedicated this window and preached. Incidentally, my diary records that on my way here to be present I met at Mascot Aerodrome, Sydney, for the first time, a young priest who was just arriving from England. David Hand had been inspired to offer himself for New Guinea on hearing the story of the martyrdom of another young priest, Vivian Redlich. My diary records of that meeting: 'He reminded me of my old Cambridge friend Alec Vidler. His full face also seemed to bear resemblance to the Archbishop of Sydney' (who at that time was Arch bishop Howard Mowll). I went on, 'I was very impressed with him and felt he had been sent to us by God, perhaps maybe the ultimate answer to our needs for the future when I need Episcopal help in my own great responsibilities if this Diocese is enlarged'. So wonderfully does God work in making the blood of the Martyrs the seed for future life in his Church, that some four years after I first met him, he was consecrated as an Assistant Bishop to me on St Peter's Day in 1950, at Dogura, and as you well know, after some thirteen years, he succeeded me as Bishop of New Guinea in 1963 and was fourteen years later to become the first Archbishop and Primate of a [2/3] Province of Papua New Guinea which, instead of having one Diocese only, has five Dioceses, and he still remains as such. Now let me speak further about your New Guinea Martyrs memorial window. Forgive me if I speak of much that you may already know, but I rather guess that after thirty-five years from its erection, many in this present generation may have often admired it but not realised and grasped all that is contained in it, and the fullness of the witness that it gives. This big three light window is indeed a great work of art and thought to be one of the most perfect works carried out in Australian coloured glass. The theme of it is an inspiration. It was entirely the conception of Canon Maynard with Napier Wailer as its artist. The theme represents BEAUTY, TRUTH and GOODNESS--three of the attributes of God himself--and shows these being represented and revealed in the Church in Papua New Guinea. Taking first the left-hand light: the top panel is of a woman missionary among primitive children, holding up a flower revealing God through the beauty of nature. Above the first panel is represented the Holy Spirit coming down as a dove. The next panel immediately below it shows a woman missionary in a primitive mission school--as many of them were in those days--teaching the truth as it is in God. Two of the four martyred women missionaries were teachers. Mavis Parkinson of the coastal station of Gona was one, and I remember how when I suggested to her some months before her martyrdom that she should be moved to an [3/4] inland station which I thought might perhaps be safer, though it proved later that it would not have been so--how she implored me with tears in her eyes not to do so, saying, 'What will the children do if I go?' And then there was Lilla Lashmar of Sangara, who in her last letter to her mother a short time before the invasion, writing of the uncertainties of life then, said, 'I only want to be a good soldier of Jesus Christ'. The bottom panels of each of the three lights portray martyrdom, and the bottom one of that first light shows two women missionary martyrs and the two Papuan martyrs fleeing before the Japanese. We may think of those two women missionaries as representing Mavis and May, often called 'The two Gona Sisters'. I have already given you a glimpse of the confidence I was privileged to share with them which enabled me to see dearly the purity of heart that was in them and the measure to which they counted the cost, and their willingness and readiness to give up all for Christ's sake. When speaking to them of what the Japanese might do to them if they came they simply said 'We are in God's hands, and are ready to suffer for them if he so wills'. I felt humbled indeed after their deaths to realise that I had seen in them the true martyrs' spirit of selfless devotion; and I felt indeed that immediately they had passed through their transient sufferings, terrible though they may have been, by being taunted by their captors and then bayonetted to death over an open grave, their Glory must have been unspeakable. The Church in New Guinea from its earliest days owed so much to its women missionaries--but of that I have not time to speak tonight. Then we can see depicted in that bottom panel the two Papuan martyrs, Leslie Gariadi and Lucian Tapiedi. Leslie, the faithful helper of Father Henry Matthews who died with him; and Lucian, the loyal and faithful attendant of the Sangara missionaries, who was killed by axes by the heathen people who took the missionaries captive to hand [5/6] them over to the Japanese, when he stood up for them and tried to defend them. Of all our martyrs in Papua, his body and that of the two Gona Sisters alone were recovered, and it is appropriate that white and brown should have been eventually laid side by side in graves at the Sangara Mission Station, even though that was to be eventually devastated in the Mt Lamington eruption of 1951. Turning now to the middle light of our New Guinea Martyrs memorial window--the top panel shows the glorious Cathedral of St Peter and St Paul, Dogura, and the pro cession led by me, as Bishop, on its way to the Consecration at which your one-time Vicar Father Maynard was present. This symbolises BEAUTY, first revealed through nature, now expressed in the worship of the Catholic Church in that beautiful House of God which gave such inspiration to all of our martyred missionaries when they were assembled there for our Conference in 1941, less than a year before they were to lay down their lives for Christ. The second middle panel is of the Procession formed outside the Cathedral, and the then Archbishop of Brisbane, the late Dr William Wand (later Bishop of Bath and Wells, then Bishop of London, and then Canon of St Paul's Cathedral, London) seated and hearing the Petition for its Consecration being read out. This symbolises TRUTH expressed now in writings. And the third panel is of the interior of the Cathedral before the High Altar at the time of Communion--a Priest giving communion the GOODNE of God in the Sacraments, clothed in purple vestments because it is through suffering that we enter into [6/7] glory and triumph. Beauty, truth and goodness. And below is the martyrdom of three priests. Actually there are four priests commemorated today, for besides the three working in Papua, Vivian Redlich, Henry Holland and Henry Matthews, there was also John Barge, beheaded by the Japanese in New Britain. He was the only one I did not know personally, for at that time New Britain came under the Diocese of Melanesia, only to be taken over into the Diocese of New Guinea in 1949. Of the three I knew so intimately, I have already spoken of Vivian Redlich; that happy, youthful, gifted, gallant soul--and yet subject as kindred spirits like him so often are, to depressions. A former Bush Brother in the Rockhampton Diocese who, when his term of service in the Brotherhood was over, decided not to go back home to England whence he had come, but to offer himself for missionary service in New Guinea, and who had joined us only a year or two before he laid down his life for Christ. We rejoice to think that the story of his martyrdom which, as I have already said, inspired David Hand to offer to take his place in New Guinea, is enshrined for all time in the Chapel of Modern Martyrs in St Paul's Cathedral, London. Then there was dear Henry Holland, one who was aging in the Master's service; simple, sincere and wholly surrendered; living, loving and working only for his Master Jesus Christ; first, and for many years as a lay Apostle of Christ to the peoples of Sangara and Isivita, and then to the great joy of himself and his people, endowed only a few years before he was called to make the supreme sacrifice [7/8] with the gifts of the priesthood, that he might minister sacramentally to those whom he had led to the knowledge of Christ. He had resolved to put a white flag up on his station; thinking in his simplicity that the Japanese would respect that, and he had resolved to stay on his station, and only at the last moment he realised that if he did so the Japanese would not only kill him--he was ready for that--but all his Papuan fellow-workers and their families, and so for their sakes only he left it for the jungle, only later to be beheaded with the other missionaries. Then there was that faithful servant of God, Henry Matthews, who had been for many years Rector of Port Moresby, and who at the general evacuation at the beginning of the war decided to remain to act as chaplain to the then very young and inexperienced Australian soldiers being rushed up to Port Moresby to defend it and Papua. In the months that followed, though his own home and church were shamefully looted by those very soldiers whom he had stayed to serve, he did most noble and self-sacrificing service and became beloved and admired by all as he went about doing his Master's service. I spent some weeks with him in April 1942 over Holy Week and Easter and witnessed, and was humbled in doing so, his courage, fearlessness and complete disregard of his own personal safety. Great was his grief when the military authorities decreed that as he was well advanced in his sixties, his chaplaincy must cease on 8 August and it was on the previous day, August, the Feast of the Name of Jesus, when he was still a chaplain, that he was killed by machine gun fire when [8/9] travelling by sea to minister to some mixed race peoples in the west of Papua. Finally I turn to the third light of our window. At the bottom is represented the martyrdom of two other women missionaries and a layman. We can think of these as being the two Sangara Sisters, Lilla Lashmar and Margery Brenchley, and the lay missionary carpenter, John Duflill; all three of whom with Vivian Redlich and Henry Holland were beheaded on the Buna beach and their bodies thrown into the sea and never recovered. Of Margery and Lila I have already spoken--they had for years devoted themselves to the work of the Mission at Sangara, and their refusal and scornful rejection of all suggestions that they might go to safety was typical of their dogged determination and whole hearted acceptance of their vocation as missionaries; and their refusal continued even on the day after the Japanese landing had driven them out of Sangara Mission Station, when an Australian soldier at some risk to himself sought them out in the jungle and offered to take them across the mountains to Port Moresby. The young layman, John Duffill, had only been with us three years, but in that short time had shown a keen desire to ser and devote himself to the work of Christ and his Church, and a conscientious application to each task that had been allotted to him. He had refused to go on furlough when his furlough was due because of the pressure of his work. Had he done so he would not have been with us in those critical days and would not today be numbered among the Martyrs. He was with me in March 1942 when the first enemy attack on the [9/10] north-east coast fell on us, and he manifested at that time a courage to be admired. Then above it there is the panel of reconstruction--a missionary who is meant to represent the late Archdeacon Romney Gill, sitting surrounded by his people with plans drawn for rebuilding. This symbolises Truth being re deemed: that is the constant w of the Church; rebuilding, reconciliation, restoration. Finally, in the top panel, is a priest offering the Holy Sacrifice clothed in a green chasuble--green, the colour of growth and perserverence--and above him a vision of the Holy City, the new Jerusalem, corning down out of Heaven. This symbolises the vindication of goodness. This vindication with the great and historic truth that the blood of the martyrs is the seed of the Church I saw and felt vividly on my recent visit to Papua New Guinea, just over a month ago for the Consecration of a national, only the third so far, as an Assistant Bishop in the Diocese of Aipo Rongo. Bishop Blake Kerina was a schoolboy at Dogura when I first arrived as Bishop of New Guinea in January 1937, over [10/11] 45 years ago: Later I licenced him as a teacher and evangelist, in which he did wonderful work, and at a later date still he was the first Papuan to offer himself to me to go as a missionary with Bishop David Hand to open our missionary work in the north of New Guinea in the Highlands, where he has remained ever since. As I preached and took part in that Consecration on St Laurence's Day 10 August 1980 in St Laurence's Church, Simbai before a huge crowd of Highland Christians on the nineteenth anniversary of the landing of the first missionaries on the coast of Papua, hundreds of miles away beneath Dogura, I felt indeed the triumph of goodness over all losses, adversities and sufferings. I had felt it too on a visit I paid during the weekend before to Popondetta, that very area where most of our missionaries suffered martyrdom, which at that time when they did so had few if any Christians and was but a smallish native village and is now one of the largest towns in Papua New Guinea. And when I preached to a large congregation in the fine Cathedral of the Resurrection in Popondetta and visited other centres of vital spiritual life in that area, the Christian Training Centre, the newly transferred Theological Seminary, Newton College for the training of future clergy, the Friary of the Society of St Francis at Ururu, the Community House at Hetune of the Papuan Sisterhood of the Visitation, and the large and splendid Martyrs Memorial School for boys at Agenehambo with over 400 boys--all these have undoubtedly sprung out of the death of the Martyrs. O Almighty God, who didst enable thy missionary and Papuan martyrs, in New Guinea, in a day of sore trial and danger, to be faithful to their calling and to glorify thee by their deaths: Grant we humbly beseech thee that, by the witness of these thy martyrs, thy whole Church may be enriched and strengthened for the gathering into thy fold of thy children in all lands; and that we thy servants, following the example of their steadfastness and courage, may labour the more fervently for the coming of thy kingdom, and may so faithfully serve thee here on earth that we may be joined with them hereafter in heaven. Through thy Son Jesus Christ our Lord, who liveth and reigneth with thee and the Holy Ghost, every one God, world without end. Amen.